Spectrum Analysis in the palm of your hand! 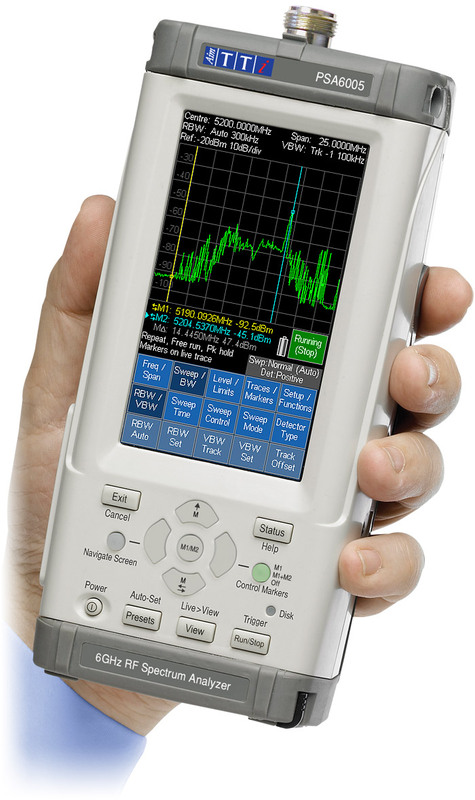 PSA series RF spectrum analyzers are unlike portable models from other manufacturers. They combine small size with low weight to create true handheld instruments that fit neatly into the hand for true portability. The large TFT colour touch-screen provides a high resolution display, and an intuitive menu system makes set-up fast and easy. Most importantly the PSA series offers exceptional value for money with prices that are far below portable spectrum analyzers from traditional sources. Series 2 / Series 5 Comparison A comparison page showing the major differences between the two PSA series. Series 2 Product Tour A set of pages detailing all of the features of the PSA series 2 (PSA1302 & PSA2702). Series 5 Product Tour A set of pages detailing all of the features of the PSA series 5 (PSA3605 & PSA6005) . Model Range, Accessories, Items Supplied - for details of the models available and the supplied items, along with optional accessories. Product Support - for brochures/datasheets, downloads, manuals, details of any software updates or other technical matters.